A: The experts will rinse your windows with safe water-fed pole gadget or use secure ropes and cherry pickers to clean lofty properties. We also offer inside window cleaning in Earls Court, done with the classic ladders and squeegees. A: This useful allows the Earls Court window cleaners to treat any skylight, sash window, French door, and other pane types on any four-storey building. A: It's simple – we won't wash your windows with ordinary tap water. Instead, the adepts will remove the dirt build-ups with filtered water that won't mar your panes once it evaporates. Q: Do I need to prepare ahead of time for the Earls Court window cleaners' arrival? A: You'll need to book a free parking space within 30 metres from your domain and on the same side of your street. You'll also need to grant the cleaners with unrestricted access to your property. A: Yes, our services are covered by a comprehensive insurance plan. Also, the pros are certified to treat windows big and small, single or double, as well as French doors, door panels and even conservatory roofs. A: We will happily clean any four-storey or multistorey commercial premises. We can also supply you with other maintenance options, such as gutter cleaning and pressure washing. With our window cleaning in Earls Court, you get a quality rinse of your sash windows, skylights, glass roofs, French doors, and other glass surfaces at modest prices. We will even present you with a complimentary wash of all PVC & UPVC frames and sills! For a detailed list of our prices, please see our price table below. Depending on your needs, our window cleaning Earls Court can provide you with three choices. 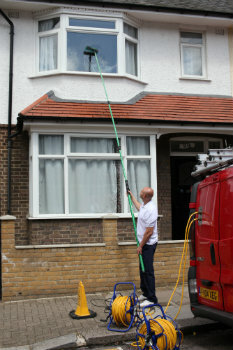 If you choose outside cleaning, the specialists will make use of a special water-fed pole. This equipment can expand up to 22 metres in length, which is identical to the height of a four-storey building. The Earls Court window cleaners will use purified water under high pressure that will blast away all stains in almost an instant. If you have a high-rise property instead, then have a loot at our rope access window cleaning. There, a team of approved climbers will painstakingly polish your windows until they spot the image of the setting sun. For your ease of mind, we check the cleaning equipment on a day-to-day basis and can send COSHH documentation at your request. For interior cleaning, the adepts will carry ladders and squeegees to ensure that even the highest spots will get proper treatment. Over time, we've responded to the washing calls of customers from many nearby regions. As a direct result, we expanded window cleaning Earls Court's horizon and you can now spot our washing vehicles in the locations below. Alternatively, get a free instant quote or order affordable window cleaning services Earls Court SW5 online, through our web site.